THANK YOU DONORS AND VOTERS OF MOULTONBOROUGH! WE HAVE THE FUNDS TO PURCHASE THE LAND AND COMPLETE THE PROJECT!! The Moultonborough Conservation Commission THANKS EVERYONE that helped to fund the acquisition of this land that, left undeveloped, will protect water quality, maintain wildlife habitat and leave historical artifacts undisturbed. Moultonborough Falls Conservation Area, is 37 acres of undeveloped land in Moultonborough, NH, in a high-priority conservation area. The land will be placed into a conservation trust and protected from development forever. We need your donations to make this happen. 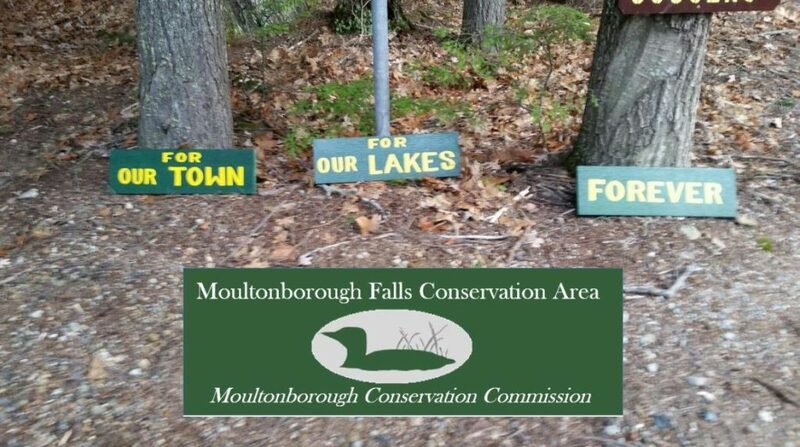 The Moultonborough Falls Conservation Area is located at map lot 76/4. It can be viewed on the town’s GIS system, by searching for property 0760004000 at this link. The property has over 3000 feet of shoreline along the Red Hill River and Lee’s Pond marshland. It provides diverse wildlife habitats and corridors, borders sensitive wetlands and has historical value. In the 1800’s, this area was the thriving village of Moultonborough Falls. Historic photographs show a number of buildings along a dirt road, and cleared land that is much different than what we see today.